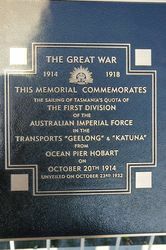 A plaque commemorates the sailing of Tasmania`s quota for the First Division in October 1914. 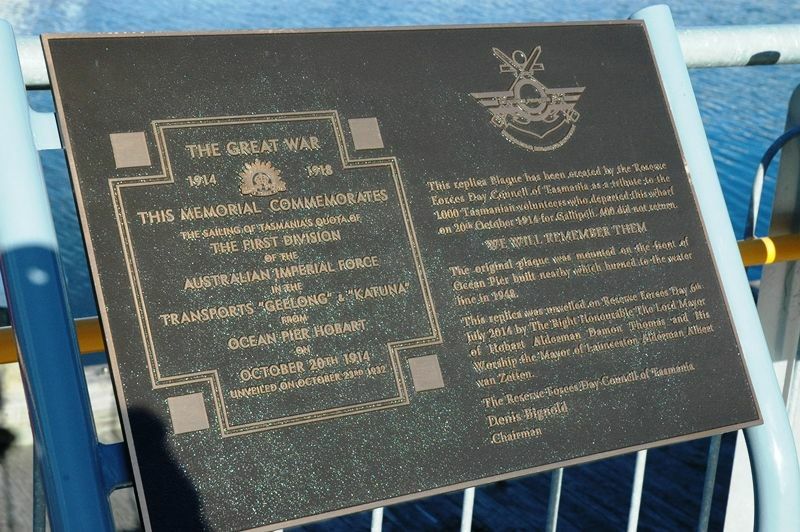 This replica plaque has been created by the Reserve Forces Day Council of Tasmania as a tribute to the 1000 Tasmanian volunteers who departed this wharf on 20th October 1914 for Gallipoli. 400 did not return. 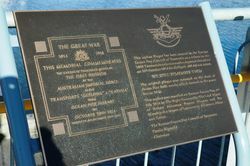 'The original plaque was mounted on the front of Ocean Pier built nearby which burned to the water line in 1948. 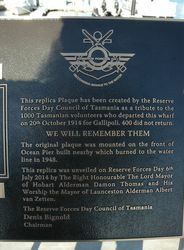 This replica was unveiled on Reserve Forces Day 6th July 2014 by the Right Honourable the Lord Mayor of Hobart Alderman Damon Thomas and His Worship the Mayor of Launceston Alderman Albert van Zetten.